Saludos todos! I hope everyone had a nice and relaxing Thanksgiving break! This week we’re continuing with our November themes of food and the cultural importance of food while also transitioning into our brief December focus on winter celebrations. We’ve spent November highlighting the importance of food in cultural celebrations and rituals as well as community environments, which has been a nice way for us to bridge the celebrations of late October and early November such as Day of the Dead, late November celebrations such as Thanksgiving, and December celebrations such as Christmas and Las Posadas. 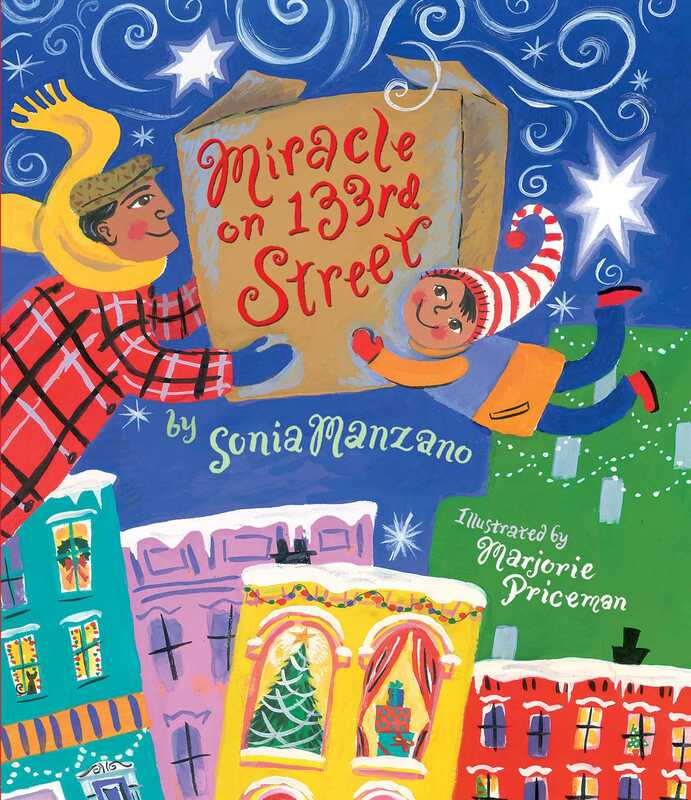 Our book for this week, Miracle on 133rd Street, written by Sonia Manzano and illustrated by Marjorie Priceman, focuses on the frantic energy of the yuletide season, as a family tries to find space for their holiday roast. The oven is too small in the family’s tiny, New York City apartment, forcing them to journey through the halls of their apartment complex, seeking help from their diverse neighbors, all of whom are also anticipating and preparing for their own holiday celebrations. The plot of finding space for the holiday roast is what drives the story showing how food facilitates community and brings people together. Food is at the crux of this exciting and endearing plot, as it is for many of us celebrating the holidays. The author, Sonia Manzano, is a retired actress best known for her role as Maria on Sesame Street. Interestingly enough, many of this story’s illustrations and scenes resemble some of the dynamics of Sesame Street, with a diverse cast of characters all coming together on the street, in the hallways, and, generally, through the lively maze of New York City. The stunning, colorful illustrations also brightens the gray and white tableau of New York City during wintertime with cheerfully colored homes, people, lights and stars. The story starts with young José decorating “the tiniest Christmas tree ever” while his mother curses in the kitchen—“she added a string of words he was not allowed to use—in English or in Spanish”—as she tries to find space for the holiday roast: “’We never should have left Puerto Rico. There we could have roasted it outside. Everything is too small here. Small kitchen. Small apartment. Small everything. We need a bigger oven.’” The beginning of this story starts with some typical holiday season sentiments, such as stress over cooking, organizing amongst family, excitement about the special occasion, while also adding another element characteristic of the immigrant experience—missing home. Although the holidays are often a special time, they can also be a sad time when people miss their homes, the holiday rituals of their culture, and their loved ones abroad: “José knew his mother needed a joke; every Christmas she got homesick for Puerto Rico.” This has been a recurrent theme in many of my holiday posts, including some from last year, such as Feliz Navidad, by José Feliciano, and some from this year, such as The Storyteller’s Candle/La velita de los cuentos by Lucia M. Gonzalez. The holidays are simultaneously a time of joy and mirth, and yearning and nostalgia, especially for those living between two countries and two cultures. Mr. Ray agrees to cook their roast in his big pizza oven and José and his father wait patiently in the shop as it cooks. José even dozes off for a little while, but when he wakes up, he is overwhelmed by the delicious scent of the roast and all of the happy feelings and memories associated with it: “And that’s when it hit him. A scent. A most glorious scent. A scent so garlicky and olive oily and delicious it made you want to eat—even if you weren’t hungry. A bouquet that made you feel excited, except you didn’t know why. A smell that made you feel something wonderful could happen, but you didn’t know what.” The scent of the finished roast makes José and his father so happy, especially after their long journey of finding a place to cook it, meandering through waves of curious and agitated neighbors, and trudging through mounds of New York City snow, that they feel overwhelmed by love, affection, and yuletide mirth: “The aroma seemed to lift José to his feet and wrap itself around all of them like a scarf. There was nothing left to do but hug.” This lovely scene reinforces how food (the smell, taste, and preparation process) can have profoundly emotional and visceral impacts, and can facilitate unity, love and communication amongst people. This scene also shows an interesting intergenerational conflict, where José, upon smelling the roast, is reminded of all of his previous Christmases and is overwhelmed by joy and fond memories, whereas his mother, who has many more memories of Puerto Rico, is still at home overwhelmed by nostalgia and feelings of longing. In the Christmas spirit, José’s father also decides to invite the pizza shop owner, Mr. Ray, back to their home for Christmas dinner. Although José and his family miss Puerto Rico, these cultural differences and individual memories also make them feel at home in the diverse atmosphere of New York City. As a New Yorker myself, I can’t help but smile at the illustrations and scenes of all different people, from different countries and cultures, with different lives and experiences coming together in the holiday spirit to offer some help, share some advice, or vent some frustration. As José, his father and Mr. Ray make their way back through the hall, the enchanting aroma of the roast seeps through the doors of all the neighbors. Everyone comes out to fawn over the delicious, mouth-watering roast, and José’s father invites them all to come over to help them eat it. Again, we see how the enchanting effect of food brings people together: “As José, Papi and Mr. Ray came through the door, the miraculous aroma filled up the apartment quickly. The guests filled the apartment even quicker.” This wonderful story, although filled with moments of mirth, love and kindness, also shows the reality of the holidays, the human and relatable feelings of nostalgia, longing, and sometimes sadness. Ultimately, this is what makes this book so wonderful—as all these different characters from different cultures with different life stories come together, they realize that they’re actually not all that different. Everyone has some sad stories, everyone is thinking about a loved one far away, and everyone is stressed with planning, finances, interpersonal dynamics—but at the end, this is what makes them all human, and this is what brings them all together. Stay tuned for one last book review before we leave for winter break!